Peak Performance Academy is Killarney's number one Strength and Conditioning facility and one of the premier gyms throughout Munster. It is our aim to provide the best service possible to help each and every one of our members achieve their health, fitness and performance goals. At Peak Performance Academy you will have access to an unrivalled facility with the best coaching and programming available, alongside an unbelieveable community atmosphere that is guaranteed to take your training to the next level. We have some of the best coaches in the game take care of all your strength, performance and body composition needs. When I first met Jared, I felt straight away that he knew what he was talking about in regards to training, nutrition, recovery and how it all works together. He has a calm presence about him that transfers over to his coaching and any advise or tips he gives me. He is a coach that I had been looking for all my life. I can see physically and mentally the benefits of training with a professional coach. He is a highly motivated coach, his approach is professional, structured, motivating and he wants to help me learn and eventually be self-sufficient myself in my training and nutrition. If you are thinking of contacting him, I would urge you to make that step, you are making an investment in yourself, you will not regret it. 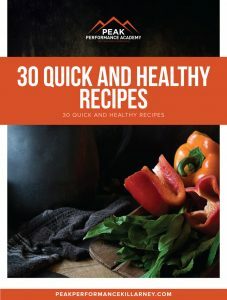 Buy our new cookbook – 30 Quick & Healthy Recipes.